Hundreds gathered Sunday January 4, at the Martin Luther King Center in Long Beach for the inauguration of Assemblyman Todd Kaminsky. 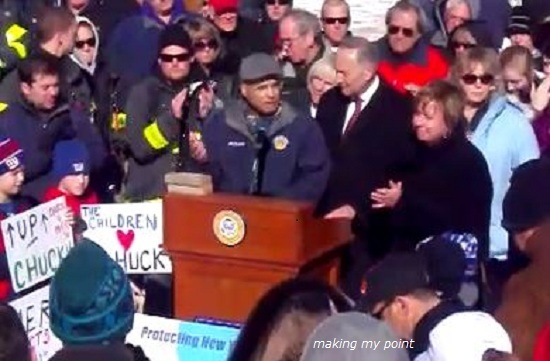 Speakers included US Senator Charles Schumer, who swore the new assemblyman in, our new Congresswoman Kathleen Rice, our County Legislator Denise Ford, James Hodge of MLK center, and State Senator Dean Skelos, amongst a dozen more. 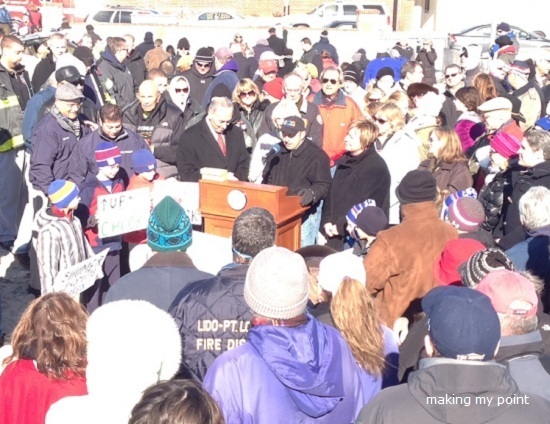 “It’s about getting things done for our area and constituents” said State Senator Dean Skelos. U.S. 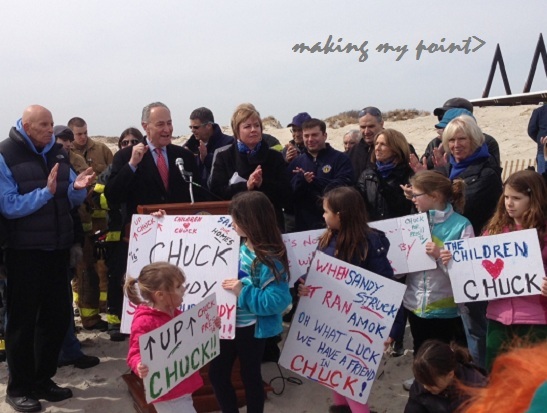 Senator Charles Schumer and Hempstead Town Supervisor Kate Murray proudly toured Point Lookout beaches that have been restored from the ravages of Hurricane Sandy. 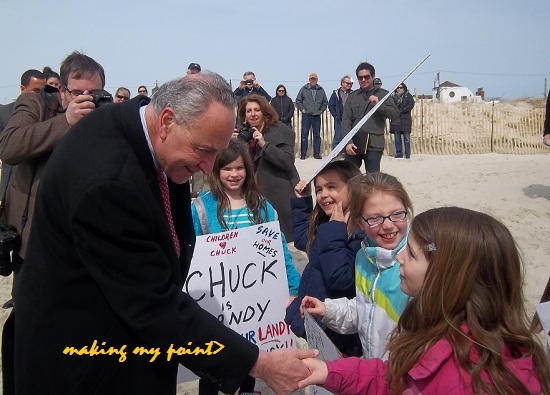 The second summer since the Superstorm witnessed Schumer and Murray welcoming neighbors back to the ocean for the start of the beach season. 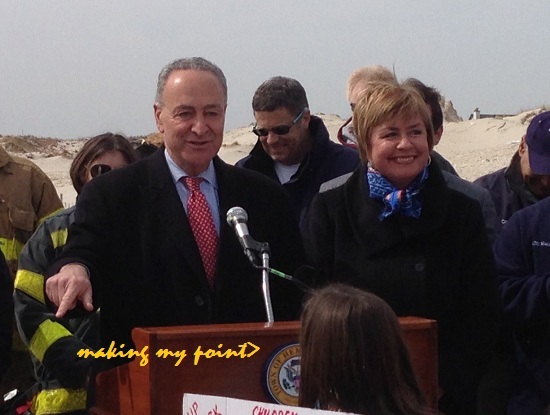 Partnering on shorefront restoration, the Senator successfully recruited the U.S. Army Corps of Engineers to dredge the Jones Inlet and place the sand siphoned from the clogged waterway onto the local beachfront. 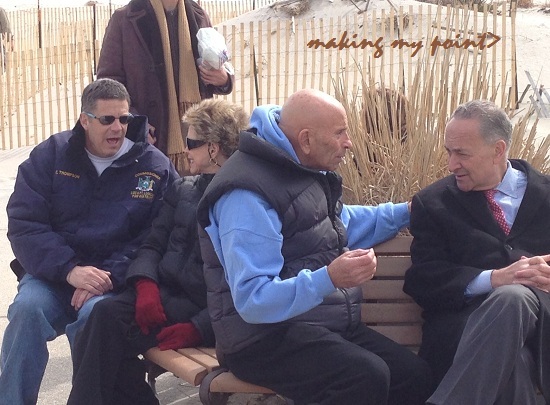 Murray oversaw a town beach restoration program that included distributing Army Corps sand that was placed on the Point Lookout shorefront to other sand-starved locations, the rebuilding of sand dunes and the planting of beach grass to preserve fragile dunes that protect area homes and businesses. 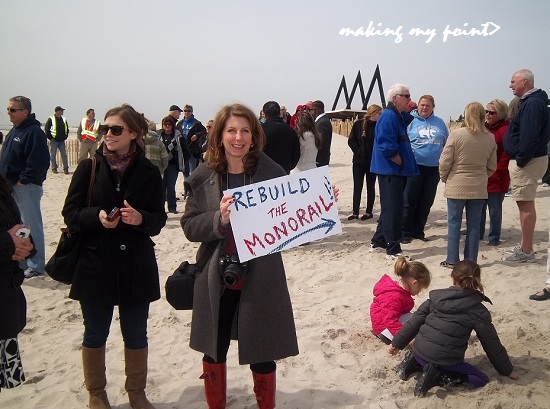 The town also performed extensive sand dune restoration and beach replenishment in the immediate aftermath of Hurricane Sandy. 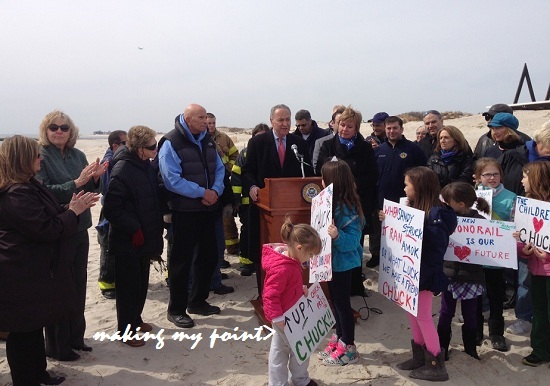 During this past winter, Schumer succeeded in having the Army Corps remove 680,000 cubic yards of sand from the Jones Inlet, simultaneously pumping that sand onto Point Lookout beaches. There were two primary benefits of the project. First, the sand-clogged inlet is now clear, removing a serious hazard to navigation for boaters. 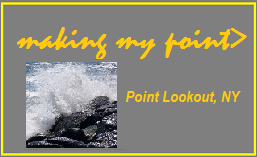 Second, the sand that was removed from the navigational channel was deposited on Point Lookout beaches, adding coastline for beachgoers and increasing the protective sand barrier between local homes and the Atlantic Ocean. 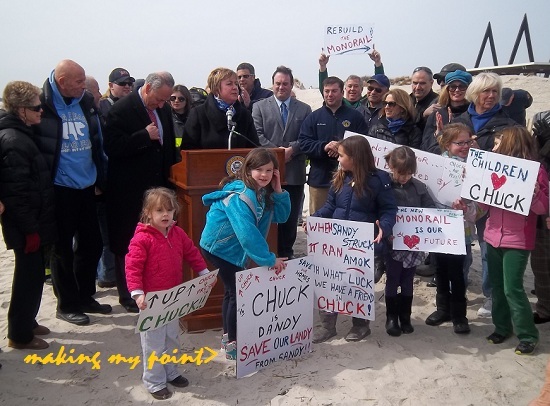 While the Senator delivered the valuable $10 million Army Corps project to the barrier island in Hempstead Town, Supervisor Murray directed the township’s Conservation and Waterways Department to “dovetail” its operations with the federal project. In direct coordination with the U.S. Army Corps of Engineers project that took place between February and March of 2014, town crews moved 50,000 cubic yards of sand west from the point where it was deposited by the Army Corps dredging operation, restoring eroded beaches and dunes. Dune restoration and beach replenishment was concentrated along Civic Beach, Middle Beach and Town Park Point Lookout, as well as other locations to the west of Point Lookout. 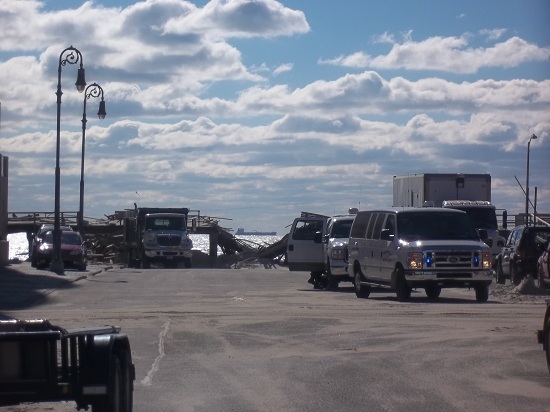 Sand was replaced at the undermined lifeguard offices at Point Lookout, cabana areas at the same beach and along the protective dune structure. 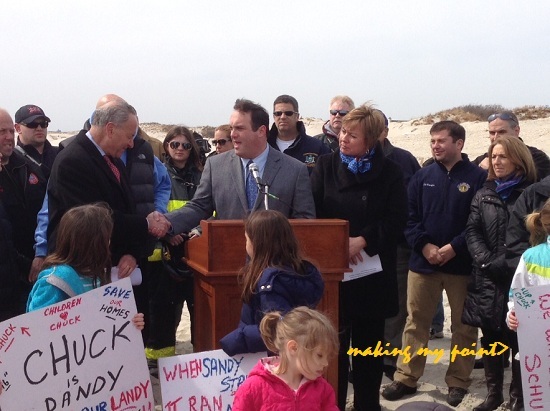 Complementing the placement of sand and the restoration of sand dunes, Hempstead Town procured 250,000 beach grass plants (ammophila breviligulata) which were planted on dunes in Civic Beach, Lido ANCHOR Beach and East Atlantic Beach. The beach grass has a dense root structure which stabilizes sand dunes and literally prevents the sand from blowing away. The plants also fortify the dunes to protect them from washing away during storms. 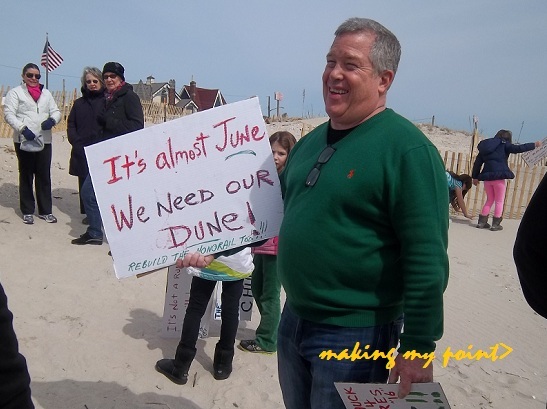 Town officials are poised to continue planting beach grass during upcoming fall planting season with the assistance of local community groups. 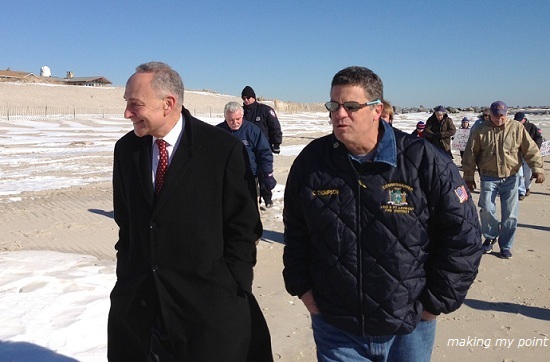 Schumer and Murray observed that the beachfront distance from dune to waterline has doubled in many areas as a result of their joint work along the barrier island. 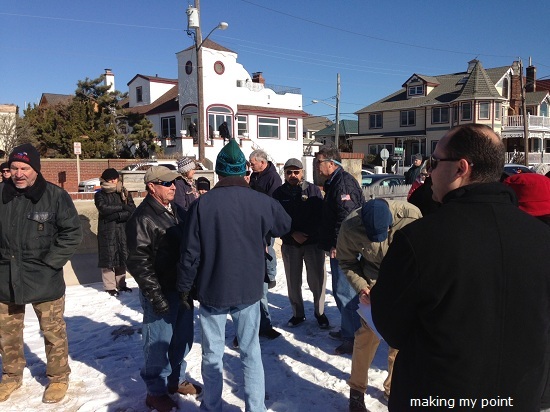 Additionally, the officials reaffirmed their mutual commitment to the Long Beach Island Project, an almost $180 million initiative, that is anticipated to commence in March of 2015. The effort includes restoration of existing stone groins (jetties), construction of new groins, replenishment of sand along coastal beaches and other engineered work to protect coastal communities during major storms. 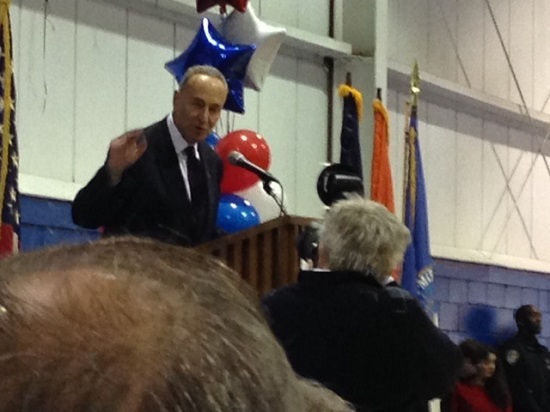 “I’m thrilled to be part of this banner day for The Town of Hempstead,” said U.S. 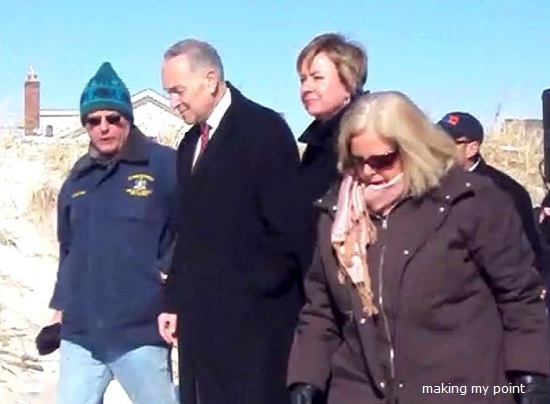 Senator Schumer. The Long Beach City Council did vote on the Army Corps of Engineers Plan to Repair and Restore the Long Beach Barrier Island’s beaches, dunes and jetties(groins). Yes, Unanimous Vote to proceed with the 150 milion dollar plan, which Senator Chuck Schumer has assured will be fully funded. Thank you to the Long Beach City Council for taking this step forward! Maybe we can all start working together again, realizing we are all integrally interrelated when it comes to protecting ourselves, our houses, businesses and infrastructure. So many of us work together and support eachother outside the political sphere, its great that this previously devisive issue has been put to rest. 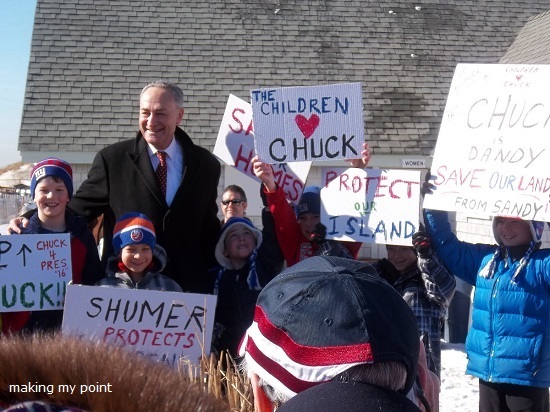 Senator Chuck Schumer and his local supporters (not in order): Tommy, Finn, Cole, Jack, Cameron, and Tommy. 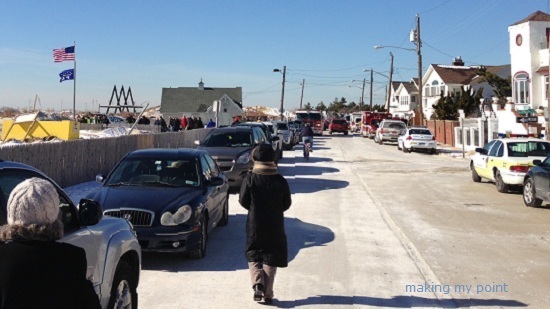 Point Lookout Civic Beach-Sunday January 27, 2013. 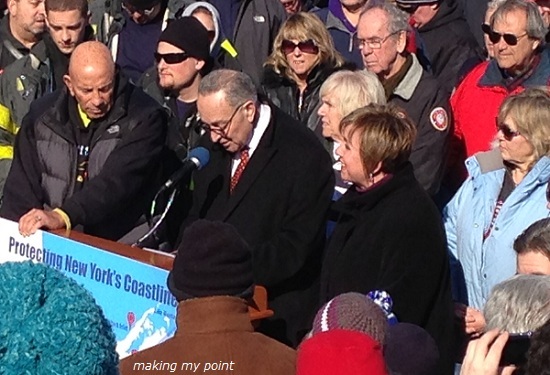 Today Local residents braved the cold at Point Lookout Civic Beach to hear Senator Charles Schumer and other local leaders address Point Lookout civic leaders and citizens about revisiting the Army Corps of Engineers plan for shoring up our shoreline. 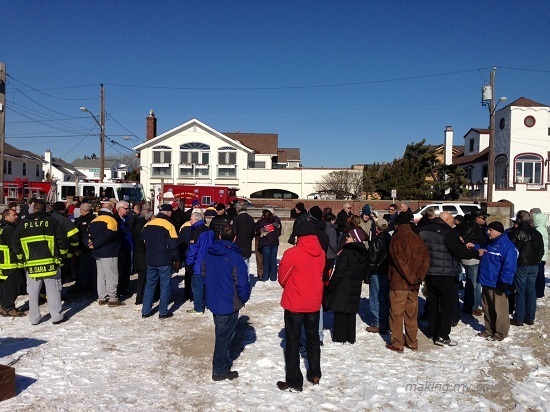 Residents and representatives from Point Lookout, Long Beach and surrounding areas gather. 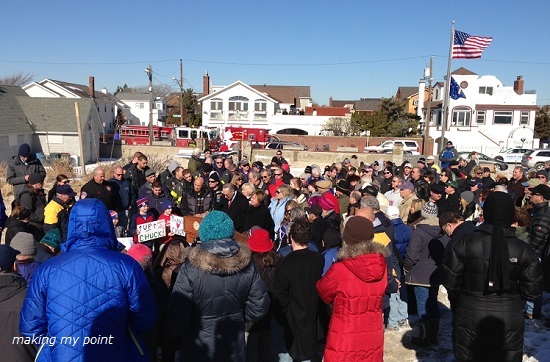 Point Lookout made a good showing to come out and stand for our town. At his side were State Assemblyman Harvey Weisenberg, Town of Hempstead Supervisor Kate Murray and Nassau County Legislator Denise Ford. Also represented were Long Beach, by City Manager Jack Schnirman and Councilman Len Torres. Also there was Asharoken Mayor Dr. Gregory Letica and many others. 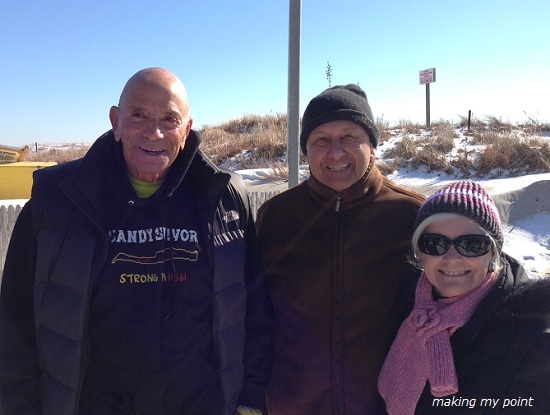 Harvey Weisenberg sporting his charity Sandy Survivor shirt. Long Beach groups are raising money with shirts like this one. Charles Schumer, Harvey Weisenberg and Long Beach City Manager Jack Schnirman make their way through the crowd. Also in attendance were members of the Point Lookout Civic Association, Lido Dunes Civic Association and about 100 local residents. At topic was bringing back the Army Corps of Engineers’ comprehensive barrier island plan for the nine mile stretch that we live on – Atlantic Beach, Long Beach, Lido Beach, and Point Lookout. 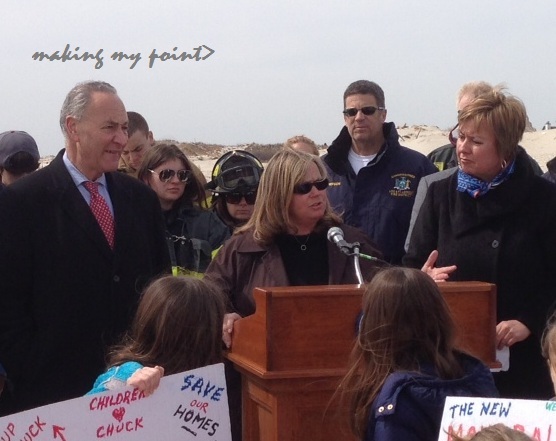 This would be part and parcel of the current Sandy Relief Aid Bill. 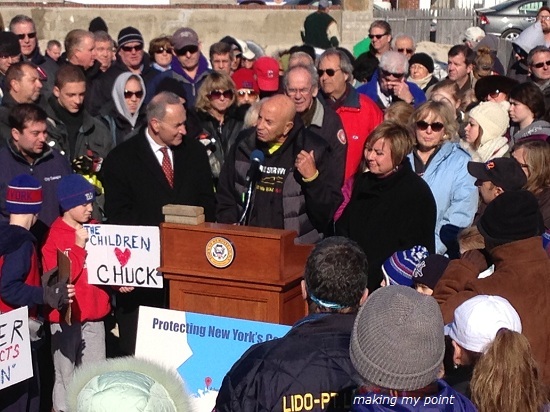 Senator Schumer Flanked By Harvey Weisenberg(Left) and Kate Murray and Denise Ford on the right. He is “optimistic, but worried”. He says they have all 55 Democrat votes secured, but will still need 5 Republican votes to pass. He had 12 commitments from Republicans, but a number have already backed out (Luger, Snowe, Bailey-Hutchinson were named). He said “most importantly, is this will give full aid to people who have lost their homes here, where the average damage is $100,000.00” . 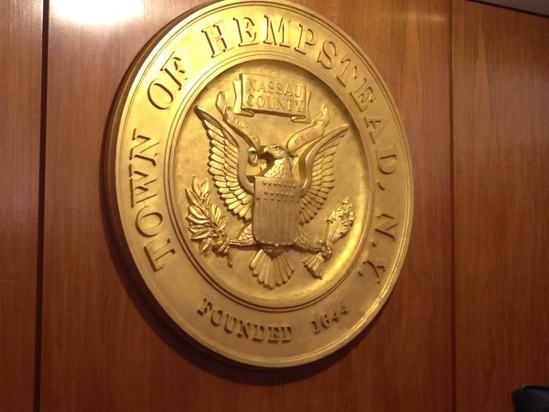 Kate Murray, Town of Hempstead Supervisor, thanked the Senator in advance for getting the aid into our municipalities and communities. Town of Hempstead Supervisor Kate Murray spoke thanking the leaders for getting the money for the municipalites so local taxes don’t have to rise. 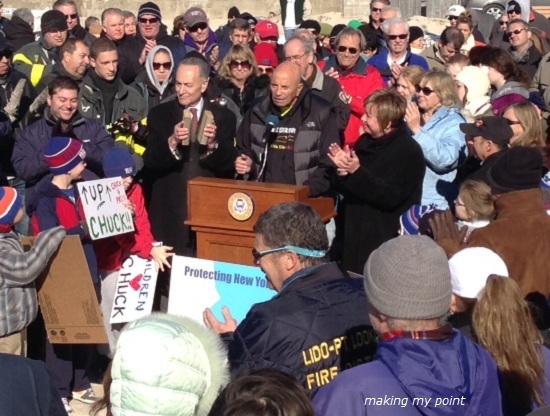 “We stand behind the Senator to help get this passed. 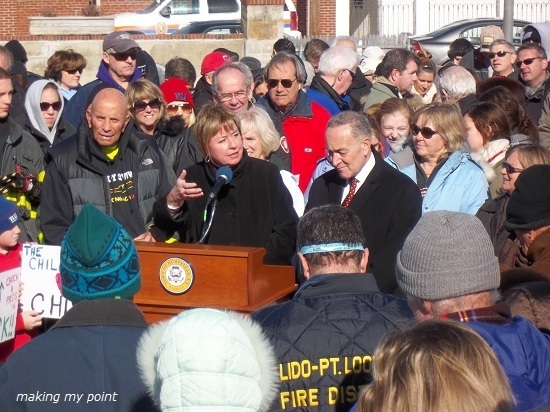 We thank the Senator and his colleagues in advance to do what is right for our towns and our residents”, and pass this legislation. Harvey Weisenberg explains getting stopped By TSA for having boardwalk in his luggage! 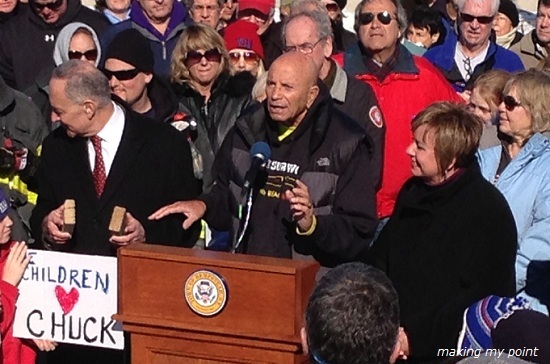 State Assemblyman Harvey Weisenberg of Long Beach spoke. He had high praise for the senator who he said was responsible for getting the generators and other equipment into Long Beach that got the city’s sewers back online. 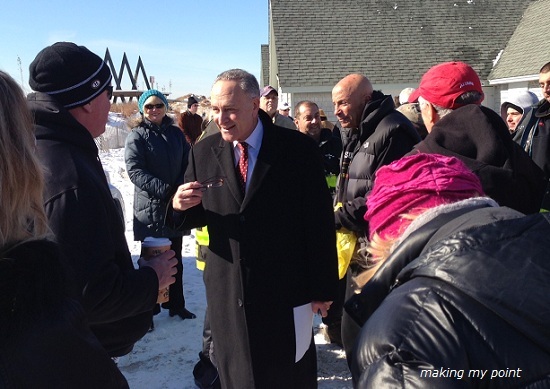 He thanked Peter King as well for going above and beyond for local residents. To show his appreciation, he presented the Senator with 2 pieces of the now-defunct Long Beach Boardwalk. 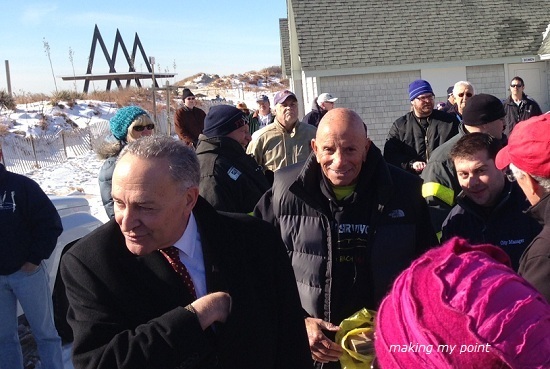 Assemblyman Weisenberg presented Senator Schumer with pieces of the torn down Long Beach Boardwalk. 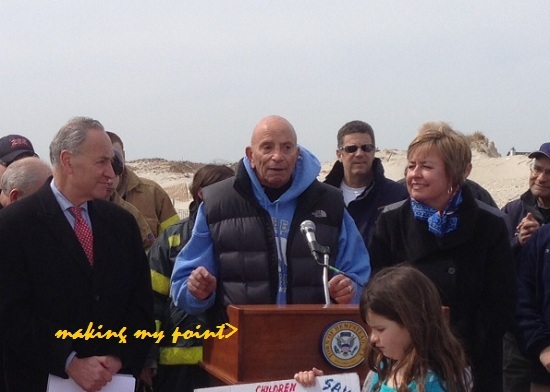 NY State Assemblyman Harvey Weisenberg speaks about the Army Corps of Engineers plan. He went on to make a short but impassioned speech saying “we need community input – get involved.” And in account of the ACOE plan “for 20 years we worked on this(Army Corps of Engineers) plan. The 2006 city council in Long Beach were intimidated by people (to kill the plan), many from out of town. They scared people that we were going to have black sand and the like. 98 million dollars was lost. Now, Six years later it’s “hey can we get that money back”. 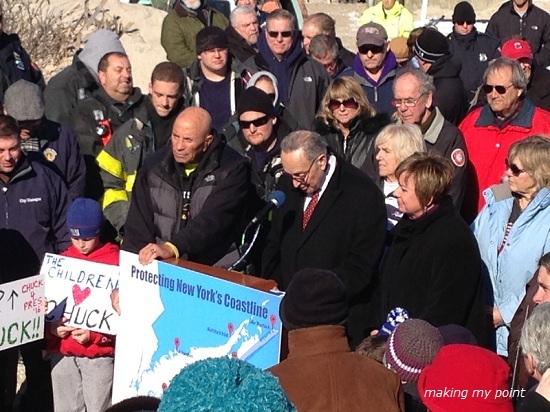 Assemblyman Weisenberg Thanked Senator Schumer and Representative Peter King for their help throught the Sandy recovery. A member of the audience asked “what if Long Beach votes it Down again”? Len Torres says the majority is for the Army Corps Plan. Asharoken Mayor Dr. Gregory Letica speaks about the vast damage in his town. 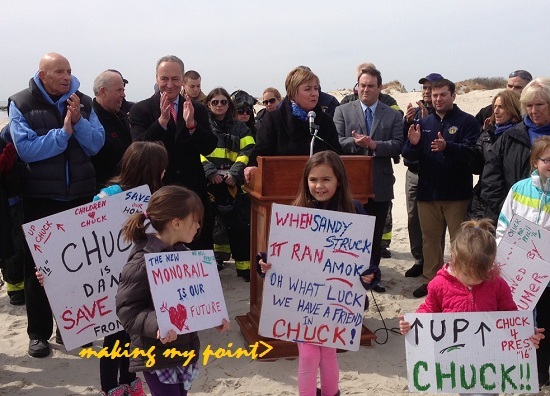 With that, the representatives surveyed the damage and Supervisor Murray showed the Senator what we have been doing here to dredge sand and make emergency dunes for whatever minimal protection we have at the moment here in Point Lookout. 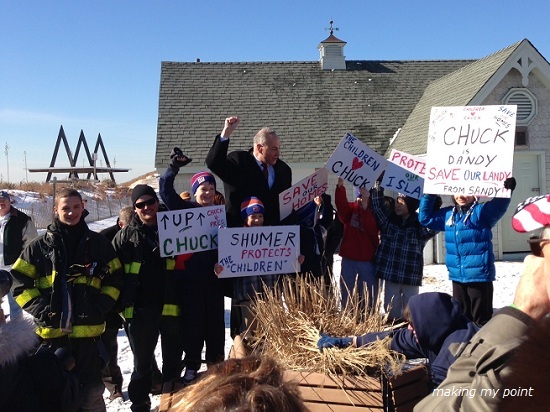 Andy Richter speaks to Senator Schumer about Fire Dept issues. 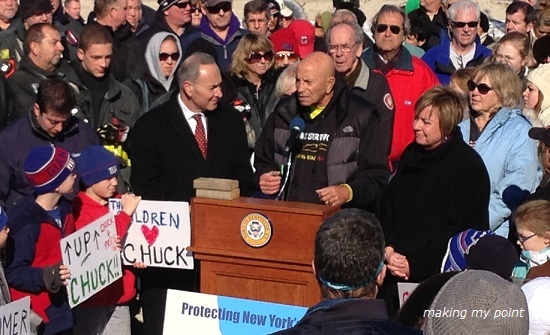 The Senate vote on the Sandy Relief Aid Bill is set for 5:30PM, Monday January 28. 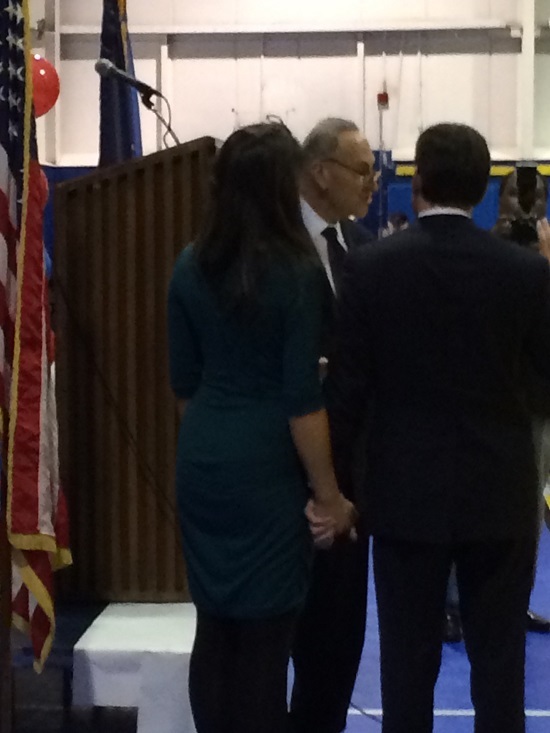 “Hopefully I can call my friends (here Monday Night) at 7 and say “it’s done”, said Senator Schumer.